Rich bronze foliage is set alight by spectacular single flowers in shades of red, pink, orange, gold and plum. Loved by pollinating insects, an excellent cut flower plus the petals are edible… enjoy the opulent display from July to October. Treat this tender perennial as a half Hardy Annual. Unique delicately feathered petals with a heavenly fragrance, perfect for cut flowers or plant them by a path or garden seat where you (and pollinating insects) can enjoy them throughout the summer. Early sowings can flower in the first year. Height to 40cm. The erect stems carry large yet delicate looking flower heads of pink, rose, white and lavender. 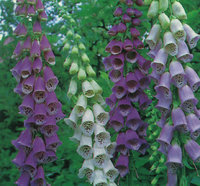 This is a beautiful choice for cutting, flowering July to August. Height to 90cm. Annual Price for 40 seeds. Enjoy masses of bicoloured powder-puff blooms in eye catching shades of fiery red and orange: their alternative name is Firewheel. At 35-45cm tall consider these for patio tubs and path edges and even, as they are spreading, for hanging baskets. This is a multiflowered Gypsophillia with pure white blooms. It makes a medium tall plant that is perfect for cutting. Flowers June to August. Height to 60cm Annual Price for 500 seeds.